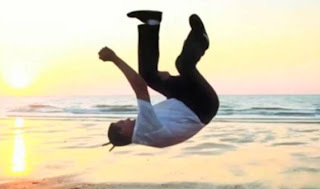 The art of b-boying (you might know it as breakdancing but the majority of practitioners really don’t like the term!) has certainly developed and evolved since it first started in the early 1970s. It still has the power to mesmerize as you will see when you watch this video created by David Olkarny featuring b-boy Karimbo. I have no idea how he gets himself in to some of the positions seen in this short film but that is probably the whole idea! In fact I had to watch this twice over to even begin to take in the moves. Still not so sure about the dive bomb in to the stream even now!